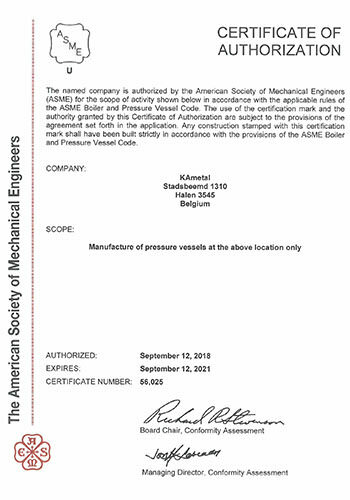 In 2018 Kametal became an ASME “U Stamp” authorized manufacturer for the manufacture of pressure vessels. American Society of Mechanical Engineers (ASME) is a professional organization focused on technical, education and research issues in the engineering and technology community. ASME develops and maintains internationally recognized industrial and manufacturing codes and standards that enhance public safety. 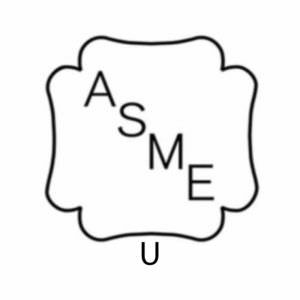 In 1911, ASME formed a committee with the objective of formulating a collection of standards to govern the manufacture of steam boilers and other pressure vessels. This need became apparent shortly after the invention of the steam engine in the late 18th century. In the 19th century there were literally thousands of boiler explosions around the world. The committee is named the Boiler and Pressure Vessel Committee. It is currently responsible for establishing rules of safety governing the design, fabrication and inspection during construction of pressure vessels, and to interpret these rules when questions arise regarding their content. ASME has accredited companies in the pressure vessel industry to certify that their products, services and quality system comply with the ASME Boiler and Pressure Vessel Code. This acceptance and certification is symbolized by the “U Stamp” for pressure vessels. The U Code Symbol on a vessel is used to confirm that the stamped item is in conformance to the latest edition of the Code and that the pressure vessel has been designed and manufactured in accordance with ASME. All aspects are reviewed and approved by a Third Party ASME Authoried Inspector (AAI). For over 20 years Kametal has been combining the craftmanship with the modern technology in the sector of steel constructions. © 2017 - Kametal International. Powered by Exiga.